On a late night driving back from Nebraska, this place greeted me with a bright neon "Open" sign. The first place I tried on a cold Monday night was closed, so this was my last chance in this trip to grab a tenderloin. Location: 608 Davis Ave. in Corning, Iowa (population 1,783). Its about 70 miles southeast of Des Moines in Adams County. Directions: Corning about a mile north of the busy state highway between Creston and Red Oak. Take 148 into town and follow signs marking the business district. 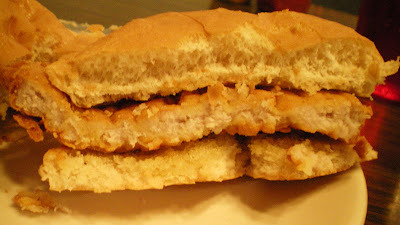 The Tenderloin: This was described on the menu as "Homemade Breaded Loin" sandwich. My plate arrived with a steak knife to cut the sandwich into easily lifted halves. The edges clearly bent upwards. The breading was a little to fine for me, meaning no crumbs fell to the table. The meat was bright white and soft. Served with fixins on a toasted bun. Overall 6.5 out of ten. 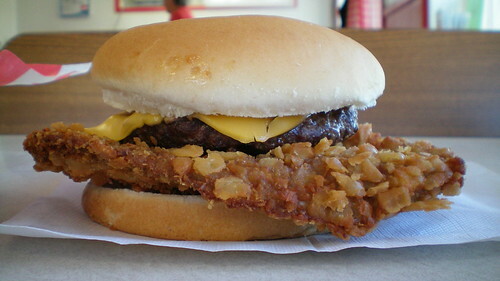 Also on the menu: The fries are homemade, also serving steaks and hot beef with daily specials. Service: Seat yourself table service with one waitress and one cook when I arrived towards closing time. Ambiance: This is a small town diner in a cute main street with furnishings to get a homestyle look with family pictures and simple decorations. The "Kafe" is connected to a bar next door. Final Thoughts: Corning is an alright place to stop off while driving through southwest Iowa. The mainstreet are has many small shops to check out. This isn't exactly a destination tenderloin, but it kept my craving in check as I drove home. 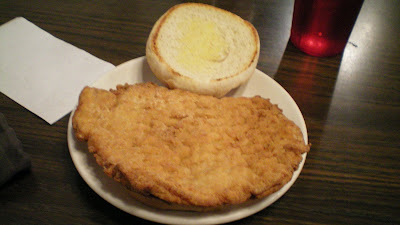 Everytime I visit your blog I get homesick for Iowa & a good ole Tenderloin. My fav is at the Oakland Mills Bait Shop near Mt. Pleasant. Have you been to Deano's in Lockridge? love this site-it makes me homesick everytime I visit. 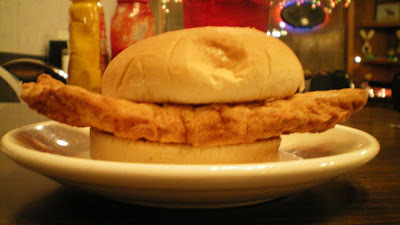 My fav is the tenderloin at Oakland Mills Bait Shop near Mt. Pleasant. I've heard good things about the bait shop in the unincorporated township of Oakland Mills. I only get to Mt. Pleasant about once a year. 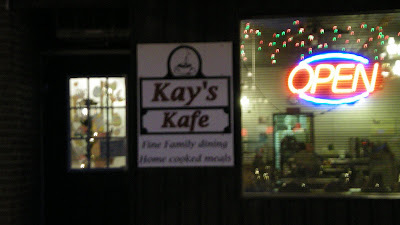 Kay's Kafes tenderloins are truely homemade. They are not a fritter. They are breaded right there by the owners. They are also fairly large. You could put it on two buns easily. Mmmm now I am hungry for one.